Once upon a time May 1st meant something. It was a big festival day filled with parties, dancing, and lots and lots of flowers. There were May pole dances and flower crowns and baskets or paper cones of posies secretly left on doorsteps, as a way of wishing friends and neighbors a bountiful summer. It was such an important holiday, May 1st has been celebrated in literature and paintings through the ages. But these days it’s a very different story. We’re more interested in Margaritas on May 5th than posies on May 1st. And while we love a good Cinco de Mayo fiesta, there’s no reason why May Day should fall by the wayside. Especially when you can use it as an opportunity to create a sweet tradition with your kids. We can do without the dizzying May Pole dance, but one May Day tradition we’re determined to keep alive is what we call “playing the Flower Fairy.” Secretly hanging a sweet little bouquet from neighbors’ doors is just a lovely way to brighten someone’s day and celebrate nature and the return of spring. It gives kids the chance to be the givers, rather than the takers, and do something thoughtful for their friends and neighbors. Plus, it’s not crass and commercial. It’s crafty, doesn’t require a bunch of equipment, and reminds us to, quite literally, stop and smell the roses. 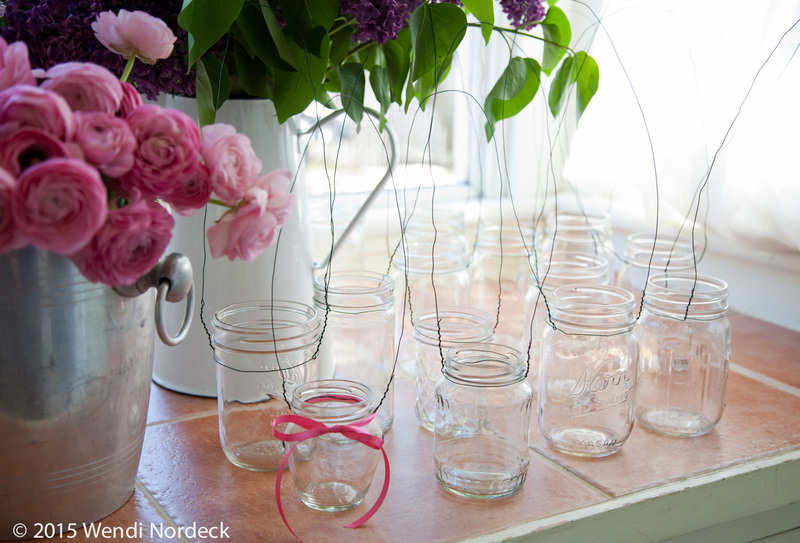 Instead of paper cones, which won’t hold water to keep the blooms fresh, we prefer using glass jars, whether they’re old jelly jars we’ve been saving up, or a new batch of canning jars from the store. To make the hanger, we use floral wire, which is thin, coated and easily available at craft stores. Just wrap the wire around the top of the jar, with enough extra to make a handle so you can hang the jar from a doorknob. … in a range of shapes and sizes. Or snip flowers from your yard. Or both. Try bulking up on inexpensive filler flowers like carnations and daisies, and add just a few pricey blooms for maximum impact. Then just add a ribbon and a tag, some water to keep the blooms fresh, and unleash your flower fairies upon the neighborhood.